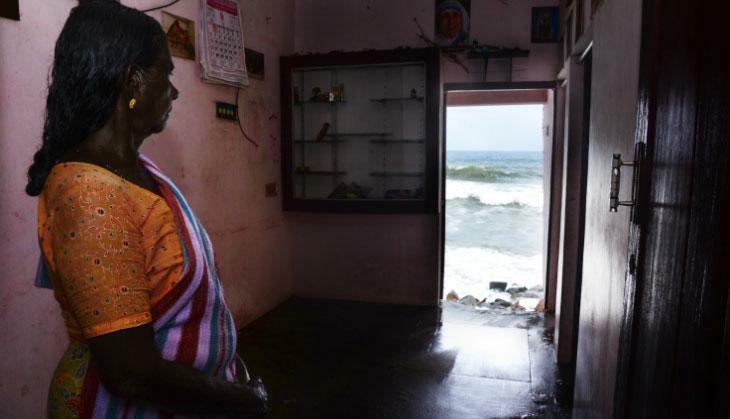 Hundreds of families in Kerala’s coastal villages have lost their houses because of coastline erosion over the last five years. Constructing sea walls has been Kerala’s main defence against the drastic erosion. However, it has proven to be a failure and experts feel that these walls can in fact have an adverse effect. Natural remedies, more studies on sustainable solutions and a focus on rehabilitation of affected communities are currently needed to deal with the issue of coastal erosion. Sixty five-year-old Maria sits at the doorstep of her demolished house. The only thing that remains of the house is a wall attached to the door. Every morning, she comes “home” and sits there till the evening, ruminating over her memories from the time when she and her family had started to build their new house. “My family and I lived in this house just for two years. One night there was an announcement for us to go to a relief camp as the sea was rough. When we returned the next morning the house was ruined by the waves. We were heartbroken,” she lamented. Maria lives in the coastal area of Valiyathura in Thiruvananthapuram district of Kerala. As per official records, 110 families have lost their houses in Valiyathura alone because of coastal erosion and rough seas. Another 100 homes have been damaged in the nearby fishing villages of Poonthura, Panathura and Bimapalli, all over the last five years. About 200 fishermen families are living in different government schools, which function as temporary relief camps. Three or four families live in a single classroom, sleeping on floor and cooking inside the same room. Many of them go to the shoreline regularly in the mornings, to see the remains of their houses. “We are living in this school for the last five years. My child does not know how to live in a house, he was born here. We had a three-bedroom house there in the first row of houses on the shore,” said one of the refugees Mini tearfully. Alphine from Valiyathura, has had sleepless nights as she fears losing her home to the eroding shoreline. Ten years ago, when her house was built, it was more than 550 metres from the shoreline. Now, it is hardly three metres away. “Cracks have already appeared in the doors and windows. We have packed our things and are prepared to run away anytime from here,” she said. 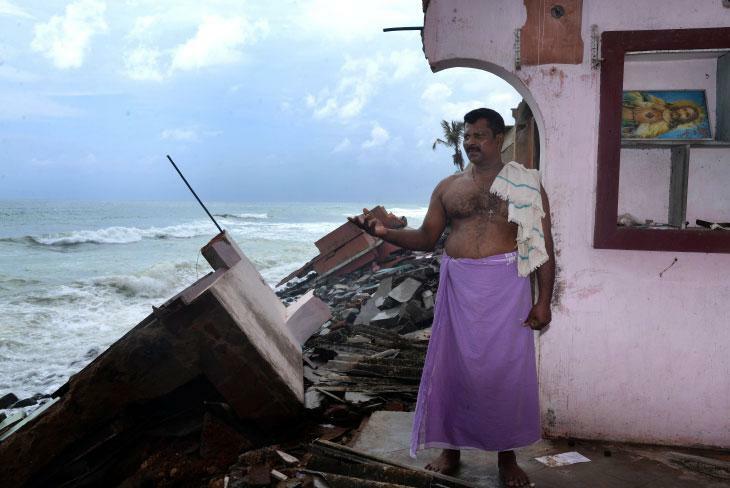 In Valiyathura, the most affected coastline of the district, three rows of houses near the sea have been devastated. Another three rows — about a 100 houses — are under severe threat. Like in the case of Alphine’s house, most of these already have cracks. Sanghumugham is one of the most popular beaches in the district. 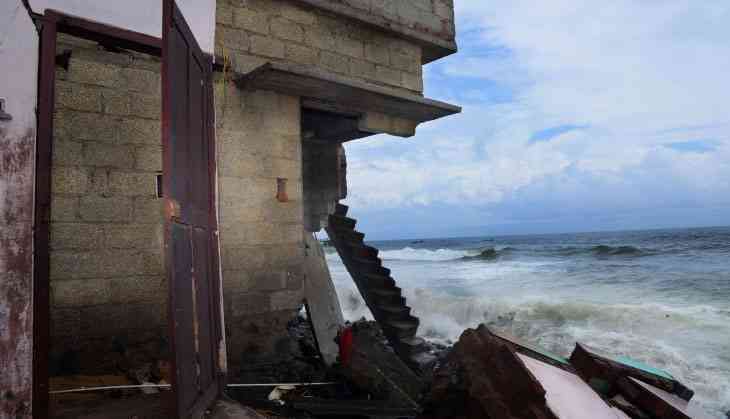 The sea wall here is completely broken and the beach has been eroded in this southwest monsoon, which began in June. The shoreline change assessment for Kerala, prepared by the National Centre for Sustainable Coastal Management (NCSCM) states: “a major stretch of Kerala’s coastline (63 percent) is eroding.” The report also says the erosion is highest in Thiruvananthapuram district. “There are two types of erosion: cyclic and progressive. One need not worry about cyclic erosion as erosion during the rough season gets balanced by accretion during the calm season in a year. Progressive erosion is the one that has to be addressed as it is continuous. The reason for progressive erosion needs to assured through scientific studies and appropriate corrective measures can then be taken,” D. Ilangovan, senior principal scientist at the National Institute of Oceanography (NIO), told Mongabay-India. The erosion in Valiyathura, Poonthura and Panathura of Thiruvananthapuram seems to be progressive as the beach was not restored. But in Shangumugham the erosion is cyclic and the beach gets restored after the rough season. Constructing sea walls has been Kerala’s main defense against the drastic erosion. However, it proved to be a failure and experts opine that these walls can in fact have an adverse effect. Sea walls are structures built between water and land areas, usually along the coastline to protect waves from hitting the shore and prevent soil erosion. Of the 590-kilometre stretch of Kerala’s coastline, 310 kilometres has sea walls. KV Thomas, former scientist at the Centre for Earth Science Studies (CESS) told Mongabay-India that sea wall construction is, on the contrary, one of the reasons that causes erosion. According to him, erosion during monsoon is common, but after the rains the beach doesn’t get reinstated because of the sea wall. The sediments that are washed away don’t come back, he claimed. He also analysed why Valiyathura and Shangumugham were the most affected beaches. “Both Valiyathura and Shangumugham beaches lie in between a gap of sea walls. The Valiyathura shoreline exists in between two sea walls that end on its south side and another sea wall had started from other side where the people lived in between. So it caused an elevation of water level in the gap. That is how we lost 100s of houses in Valiyathura,” he said. Cyclone Ockhi of 2017 is also attributed with worsening the situation. “This year the erosion was severe compared to previous years, because the damage that happened during Ockhi could not be repaired due to continued depressions in the sea after the cyclone,” Thomas said. “We have around 590 kilometres of coastline, I don’t think sea wall construction produces the desired effect. Sea walls and breakwaters are not scientific solutions. Putting a barrier in the coast will destroy the ecosystem. It will deepen the sea,” said Oommen V Oommen, former chairman of the Kerala State Biodiversity Board. Oommen also spoke about the need to give space for the sea to expand and contract. “Leave the sea to itself. Forty four rivers of Kerala drain into the sea. A considerable amount of soil from the Western Ghats accumulates in the sea. Due to this, beach erosion as well as beach formation happens. We should leave the sea to itself, for its expansion or its contraction,” he said, adding that instead, focus should be on rehabilitating the fishing community away from the sea. 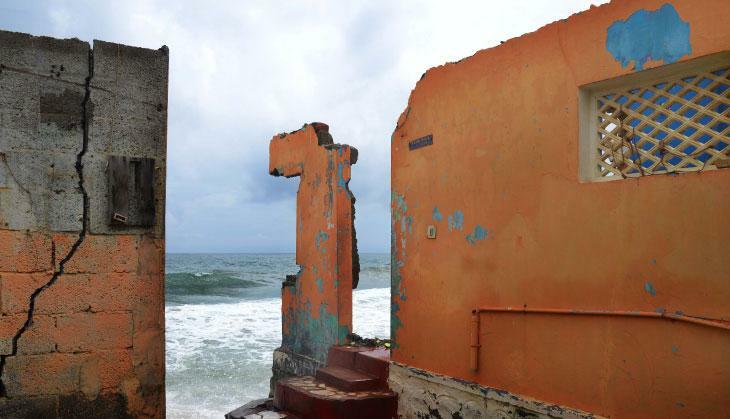 “Just one tenth of the amount spent on sea walls is required to rehabilitate the people in coastal areas. It is we who have to adapt to the conditions of the sea,” he said. National Fishworkers Forum General Secretary T Peter said that the local community that understands the sea is being removed away from the shores and unscientific human interference is causing a disaster. “Wherever breakwaters are being built on the west coast, issues like soil erosion are happening. In my childhood, during monsoon, I remember waves sweeping away the soil from the shore and naturally creating a wall using this soil in the sea. And then in September, the waves calmed down and brought back the soil. But now due to human interference, this doesn’t happen. Because of breakwaters, the soil that is washed away is not coming back,” he said. He also feels that harbours are another reason for erosion and alleged that the Vizhinjam sea port project in Thiruvananthapuram will cause huge damage to the coastal area. Thomas was in agreement about the harbours as a reason for sea erosion, but said that the Vizhanjam port may not cause an immediate effect, though in the long term it would be harmful and negatively impact the coastal ecosystem. He also said that there is an immediate necessity of strengthening beach nourishment to protect the coastal area. “The way to protect Valiyathura for the time being is to close the gap between the sea walls, even though it is not a permanent solution. That is why we need detailed studies to bring a sustainable solution to these issues. We need to study how to restore the sediments in the beach. Beaches should be divided into sub-cells of five kilometres where beach nourishment takes place. This will not be an overnight process, but a long term sustainable plan to address erosion,” he said. Oommen V Oommen affirmed that natural protection is the only way out. “We need to plant trees and plants in the coastal areas that protect our beaches. Only natural remedies can solve the issue, not manmade constructions. Coastal vegetation as well as mangrove plantations can hold the sand in the shore,” he said.